Sierra Leone's government helped British private security service firms recruit former child soldiers to work as guards in Iraq from 2009, said a Danish academic who has spent years investigating the issue. Thousands of children were forced to fight in Sierra Leone's 11-year civil war, which ended in 2002. More than 50,000 people were killed in the fighting and many tens of thousands more mutilated or raped by rebels. By 2009, with Iraq in chaos, impoverished Sierra Leone was looking for a way to engage its workforce, said Maya Mynster Christensen, a researcher at the Danish Institute Against Torture who made repeated trips to the West African country. "From a Sierra Leone government perspective the recruitment was supposedly quite a good deal because it could take the local troublemakers and send them to Iraq for a couple of years," the anthropologist told the Thomson Reuters Foundation. "The government returned the men, many of them now in their late twenties and thirties, with money earned on their overseas deployment," she said. But Christensen said this ran counter to Sierra Leone's stated policy of demobilisation following the civil war. Of the 72,500 combatants demobilised by January 2002, nearly 10 percent were children, according to the U.N. children's agency, UNICEF. A spokesman for Sierra Leone's government did not immediately respond to a request for comment. Christensen's allegations appear in a new Danish-made documentary, "The Child Soldier's New Job", which reveals that thousands of ex-soldiers were re-assigned to private security contractors in Iraq after the 2003 U.S.-led invasion. The Thomson Reuters Foundation cannot verify how many of those recruited to Iraq were once child combatants, but in the documentary those who were deployed described feeling awe-struck on arrival in the war-torn country. In filmed interviews, one former child soldier, who had only received training in light weapons in Sierra Leone, said he heard mortar shells every day in the Iraqi capital, Baghdad. "For many of the ex-soldiers, Iraq reactivated memories of the civil war. It was traumatic," said Christensen, who also works for the Royal Danish Defence College. British contractors operating on behalf of U.S. security companies recruited up to 10,000 former Sierra Leonean militia fighters from 2009 onwards, said Christensen. She said two UK-based contracting companies were operating in Sierra Leone over a three year period - Sabre International ran a training camp in Sierra Leone in 2009, while Aegis Defence Services Ltd was recruiting men when she visited in 2012. Of those recruited, around 3,000 were actually deployed, usually to guard U.S. military bases in Iraq, Christensen said. "Some of the recruits found out subsequently they would only get paid $200 per month once they got to Iraq, but a number of them went on strike when they arrived," she said. "The recruits frequently likened the experience to slavery." Sabre International and Aegis Defence Services did not respond to requests for comment. Britain's Guardian newspaper earlier this week quoted a former Aegis senior director saying the firm employed mercenaries from Sierra Leone to work in Iraq because they were cheaper than Europeans, and did not check if they were former child soldiers. James Ellery, a director of Aegis Defence Services between 2005 and 2015, said it helped reduce costs for the U.S. presence in Iraq and contractors had a "duty" to recruit from countries like Sierra Leone. Aegis was taken over last year by GardaWorld, a Canadian security company. Child rights groups were alarmed that ex-child combatants appeared to have been recruited to protect U.S. assets in Iraq. 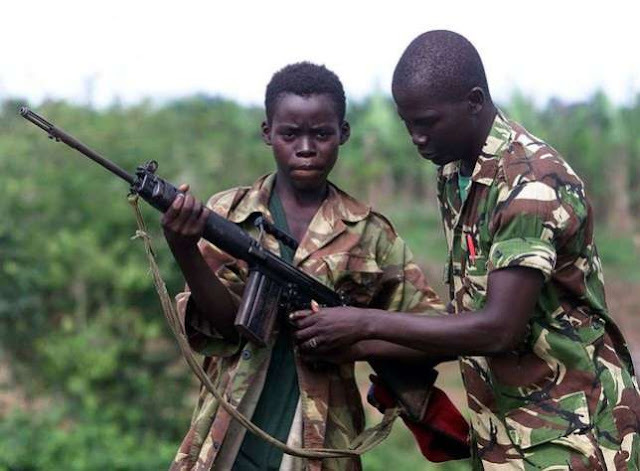 "It is surprising that a defence contractor, in its quest to find lower cost labour, should conclude that former child soldiers form a good recruiting pool," said Dan Collison, director of programmes at War Child UK, a charity helping former child combatants. "The risks of re-exposing former child soldiers to the trauma of conflict seem not to have been considered."